What a busy week it's been. All moved in so it's appliance time. We chose an LG and got 10% off at Home Depot. Our refrigerator was the first appliance to be delivered on Wednesday. We love the bottom freezer design and the fact that we no longer have to constantly buy water because it's filtered and comes straight out of our pipes through the refrigerator. I have no idea how that happens but I am just glad that it does. Then, we finally decided on a washer/dryer which for me was the hardest. I over researched to the point where I had no clue what to do anymore. Installation charges vs warranty and delivery fees vs shipping charges and on and on. I wanted the best deal and the best product but on the same brand one review would say it broke down the first day and another would say it was the best thing that ever happened to them. I was over it and we really had a lot of laundry piled up so last week on my lunch break we met up at Sears and bought Whirlpools in less then an hour. We got 10% off for using my Sears Card. They were delivered on Thursday. 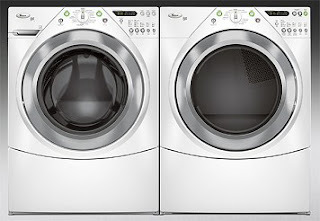 They are Energy Star certified and the washer is supposed to cut down on our water bill. We qualify for a $100 mail in rebate and I think they are pretty darn cute too! Saturday morning we were out of the house by 9:30 am taking stuff to goodwill and finally going grocery shopping after months of getting by on what we had. Our bedroom set, mattress, and sectional that we picked out a couple weeks ago were delivered that afternoon. We basically ordered out of a catalog in the store and hadn't actually seen the bedroom set in person and we were so pleased when we finally saw it. It is real wood and you can see the quality. It was my bright idea to get white and it turned out to be a good one. We got this sectional in "Oyster." We LOVE the modern look to it. I am hoping it will give me some inspiration on how to decorate the downstairs. I think there is a very good chance that our neighbors have seen me naked so it's great that we have also ordered window coverings. We had two companies come out and do quotes and went with the one that was cheap enough to allow us to do almost the whole house. They won't be here for about 2 weeks. This house has lots of windows which is nice but they are even in places you wouldn't expect like 2 in the laundry room and one in the closet. There are 12 upstairs and 7 downstairs. We are doing all blinds and I'll have to come up with window treatments only for the sliding door and kitchen window downstairs. After that it was out for some more errands. We got our paint supplies at Lowe's and went hunting for a bedspread. We got an Eastern European King size bed and apparently it's next to impossible to find that size in the stores. After Penny's and Macy's we gave into hunger and took a break. We did something we haven't done in a long time. Ate in the food court at the mall. After being busy ALL DAY we were exhausted and hungry, which seems to be the theme of the week. We happily took a break from shopping for some good old fashioned food court junk food. Sbarro's Pizza to be exact. After refueling we went to Walmart where we managed to find some king sized sheets [with a high enough thread count to satisfy Mj] to sleep on for the night. The bedspread will have to wait. 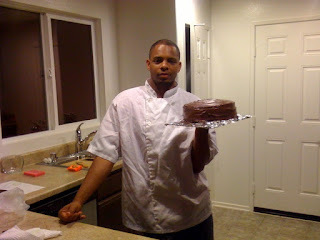 Mj is crazy a dedicated cook and he insisted that he make his Chocolate Peanut Butter Cake from scratch that night even though we didn't get home until after 9pm. He said he'd do it within the first week of moving in and so he did. The very first thing ever cooked in our new house was that and he was up until 2 am doing it. I was up too of course since I can't seem to stop myself from working on organizing and doing things around the house. So what's next? Painting of course. That project consumed our entire Sunday. Mom was kind enough to come down and help. She was our very first guest. Here she is walking in the door. She was so excited to be here and see us IN our house for the first time. We immediately put her to work. That's how we treat our guests around here apparently!! Maybe I was rushing things by trying to paint so soon after we moved in but I really wanted to get it over with and thought it would be good to take advantage of the 3 day weekend. I felt the longer we waited the less likely we would be to get it done. I told Mj a week ago that we'd be doing this. He was surprised but took the news well and went along with it. We started around 10 am with taping everything off and laying down plastic. Mom came around 12 pm and we went to Home Depot to get the paint. Our total for painting supplies was about $240.00. Mj and I did a pretty good job on choosing colors. We were right on in picking our colors for the Great Room (light green) and Master Bedroom (pale grey). We got one set of samples and that was it but after seeing our furniture in the loft we decided brown on the walls would be too much Brown. When mom and I went to get paint we found this great blue color and without even getting a sample we just bought the whole can and slapped it on the walls. Luckily Mj liked it too and it turned out to be one of my favorite colors that we used. We probably started actually painting around 2 and didn't finish until about 6:30 pm. We worked so hard but it was awesome that we all just pitched in and did it together. When you look at the finished product it is completely worth it. And now. It's DONE!! We did the loft, downstairs great room area and the master bedroom. Anything else, I can worry about later. Or not! Our reward for all of our hard work was pizza and beer. That was only just to get to Mj's homemade cake which was absolutely delicious. He really should have saved us $500 and just made our wedding cake himself because it was better then any of the cake tastings we had. Seriously! I will be asking for it every year from here on out for my B day cake. Never mind that I haven't had nor wanted a B day cake in a couple of years but this magnificent cake changes that. It was moist, tasty, perfect and with an also from scratch Peanut Butter Mousse filling, Chocolate frosting and crushed Reese's Peanut Butter Cups on top-it was the perfect way to end a fun but long, exhausting productive day. Wow! It all looks great! Have fun with all your projects. 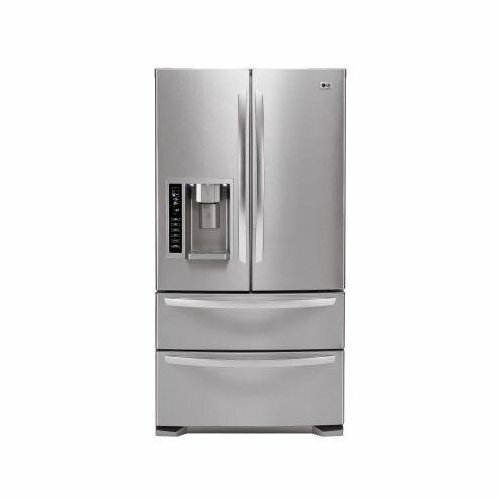 We are getting a new fridge later this summer and I want one with the freezer on the bottom. You'll have to let me know how you like it. I'm jealous of your washer and dryer, that is the one thing i am most excited to buy when I own a home. A chocolate peanut butter cake?! You are one lucky lady! Your bedroom set looks awesome. Isn't chocolate peanut butter cake the best!